Since the year of 1896, Louis Vuitton Monogram canvas has presents its unique charm in the fashion world. More than one hundred years has passed, the lightweight, supple, strong and sturdy Louis Vuitton Monogram canvas has become the one of the most recognizable fashion logo & status statement handbag all over the world. 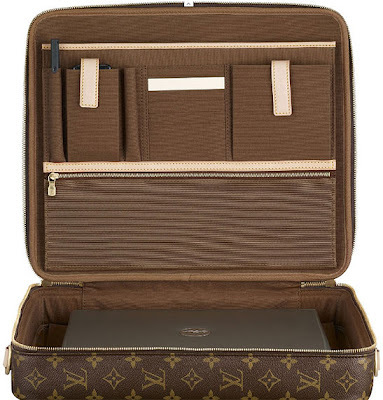 Recently Louis Vuitton website has a new addition to their fabulous handbags & luggage collection - The Cupertino Laptop Bag. In this modern “cyber age” world, almost everyone has a desktop computer at home and a laptop computer to travel with. For me, this super chic laptop bag is simplistic & elegant on the outside but when you unzip the bag, it offers up total of 6 roomy compartments for all of your laptop related essential accessories, mobile phones, business cards and it also has 6 credit card or ID card slots! The Main compartment is padded with thick layer of foam material to ensure your laptop will travel safely and looking fashionable with you! It’s a super chic unisex bag and I think it’s a must-have for all the fashionistas! 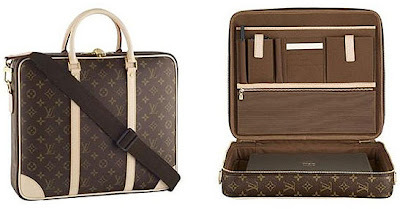 - Size: 14.5" x 12.2" x 2.8"
Click the link here (Louis Vuitton Cupertino Laptop Bag) to visit LV’s website to get one!